Yet this is also a film with profoundly melancholic undertones, one that returns again and again to the subjects of death and uncertainty, in one instance lingering for a full minute on a man cradling a dying kitten in his hands. It’s a film set in a city that has, in recent years, suffered multiple bombings and attacks, witnessed an environmentally conscious grassroots uprising followed by a repressive governmental response and endured a failed, bloody military coup. Aside from the occasional flock of pigeons, animals are often excised from onscreen urban landscapes in a way that chillingly heralds our current anthropocenic era, where “humanity’s impact on the Earth is now so profound that [it has ushered in] a new geological epoch.”[i] Kedi gently pushes back against this self-fulfilling trope, reminding us that humans are one of billions of species to have existed on this planet. Its opening text firmly establishes cats as conscious inhabitants of the city: “Cats have lived in what is now Istanbul for thousands of years. They have seen empires rise and fall and the city shrink and grow.” A sprawling, God’s-eye view of red rooftops, the Galata stone tower and the Bosphorus introduces the film, criss-crossed with white gulls. Tiny feline bodies begin to appear in subsequent shots—wandering through narrow streets, tucked into balconies, padding brazenly over roof tiles—as organic to the space as their slightly larger human counterparts. The woman, whose name we never learn (none of the humans in Kedi are named, while many of the cats are), is the first of many to remark on the ‘personality’ of cats. “They all have personalities, like people,” a woman in a market says. “Some are discreet, some will tell you all their troubles.” Bengu, a plump tabby who uses a shop storeroom as her pied-à-terre, is described by the men who run the shop as “delicate, sensitive and jealous.” Psykopath, a local black-and-white terror, is known to be “possessive” of her “husband.” Gamsız, a blithesome scamp who regularly gets into scrapes, derives his name from his perpetually carefree attitude. One man speculates that cats are aware of God’s existence. While Kedi maintains a certain agnosticism about the extent of cats’ similarities to our own species, the film clearly values these human attempts to connect and empathize with other creatures. During 2017’s hurricane Harvey, a meme circulated showing a photo of a cat swimming through Houston floodwaters, its face contorted into a snarl. Onto this poor, terrified creature, struggling to stay alive, the internet projected distinctly human fantasies of badass don’t-give-a-fuckism, a cruel irony given humankind’s role in climate collapse. Such are the pitfalls of personification: efforts to relate become efforts to assimilate, to erase difference. Such are the pitfalls of personification: efforts to relate become efforts to assimilate, to erase difference. 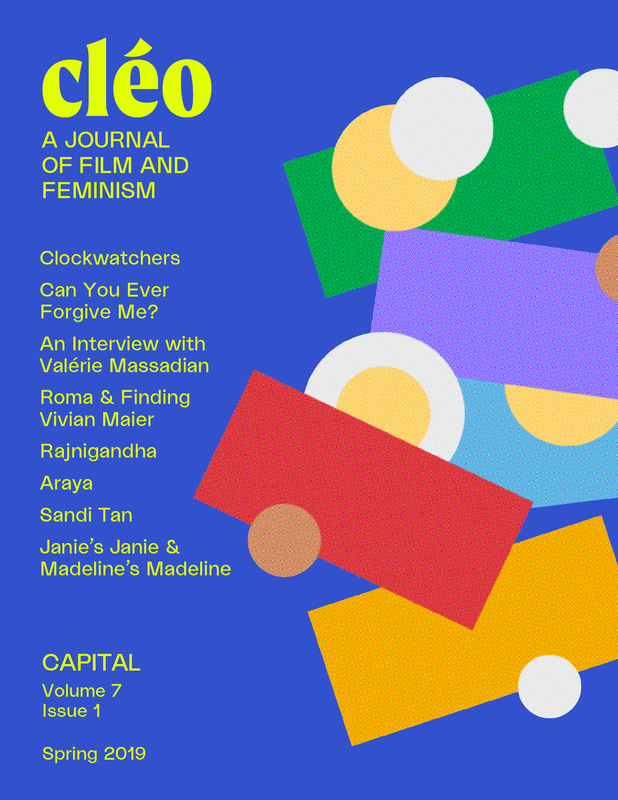 Kedi offers an alternative to this narrative when one woman describes having relationships with cats as similar to “making friends with aliens. You make contact with a very different life form, open a line of communication with one another and start a dialogue.” She speaks over a series of close-ups of high-cheekboned, long-whiskered faces, their expressions calm but inscrutable. At the moment, the opposite is true. Kedi is haunted by an overabundance of kittens: crawling out of trash and debris, discovered in nooks and crannies, abandoned, helpless, mewling. 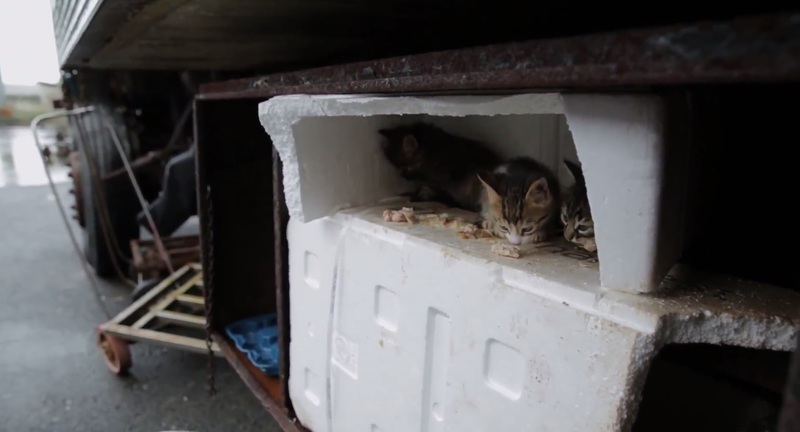 Near the harbour, an orphaned litter of newborns are totally dependent on a fisherman who comes every day to feed them milk through a dropper: “Neglect them for a few days and they’ll die.” After two women in a marketplace find seven kittens in a cardboard box, they express concern about the cats’ welfare in light of forthcoming development in their neighbourhood: “If this area gets demolished…they won’t have anyone.” Over images of mirrored skyscrapers, another local man laments the loss of orchards and green space: “It all changed over the last five years…. It used to be all green here. When these buildings went up, it all disappeared—no nature left.” The only frames filled by grass and trees appear in a scene filmed in a cemetery. Although Torun’s documentary avoids any explicit references to politics and current events, this eulogy for nature subtly conjures the Gezi Park protests of 2013: what began in Istanbul as a sit-in by environmentalists protesting plans to develop the park turned into a months-long wave of massive demonstrations against government authoritarianism that spread across the country, resulting in multiple civilian deaths and thousands of injuries and arrests. The government’s repression of dissent has only grown stronger in the aftermath of 2016’s failed military coup, so it is unsurprising that a sense of weariness and resignation colours many of Kedi’s testimonies. The government’s repression of dissent has only grown stronger in the aftermath of 2016’s failed military coup, so it is unsurprising that a sense of weariness and resignation colours many of Kedi’s testimonies. The same man, as he carefully treats a kitten’s eye infection with antibiotic drops, admits: “Doing this cured me… Before, I couldn’t talk or laugh, but let’s just say they make you fall in love again.” The woman from the gaily decorated house expresses a similar interdependence, explaining that her therapist believes her efforts to care for cats are an attempt to heal her own wounds: “They must be so deeply rooted to have not healed by now.” From imminent mass-extinction to global warming’s acceleration, it grows more difficult by the day to conceive of a way for humankind to heal the wounds we have inflicted on the home we share. One of many contributing factors is surely our tendency to celebrate, seek comfort in and prioritise spontaneous individual acts of kindness and heroism over steadfast collective action and sacrifice. 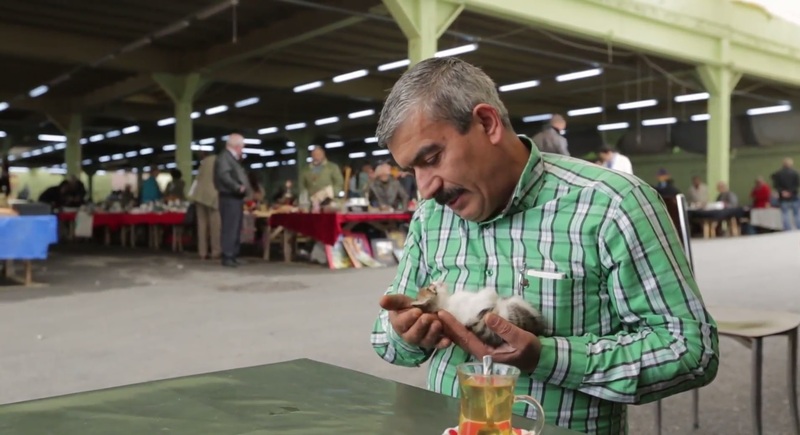 “Our concerns for street animals and our concerns for people are completely related to one another,” a woman says towards the end of Kedi. “If we can learn to live together again, maybe we’ll solve our own problems as we solve theirs. In fact, I’m sure that we would regain our fading sense of humour and rekindle our slowly dying joy for life,”—an appeal to hope remarkable for its gloom. [i] Carrington, Damion. “The Anthropocene epoch: scientists declare dawn of human-influenced age,” The Guardian, August 29, 2016, https://www.theguardian.com/environment/2016/aug/29/declare-anthropocene-epoch-experts-urge-geological-congress-human-impact-earth.